The Mac App Store is great and everything, but searching for a specific app might be an annoying procedure for many: open the Mac App Store, place the cursor in the search box (or hit CMD + F), type, wait, scan results. Wouldn't it be great to do it from the keyboard, in seconds, from the app launcher / Spotlight replacement you use every day? I use Alfred, and this tip has incredibly improved how I search for apps in the Mac App Store. In Alfred, in fact, you can create custom search queries for any website / search engine and assign them to a quick shortcut that can associate terms to the query. Like "google MacStories" will open a tab in your default browser with a Google search for MacStories, and so forth. With this same method, you can create a Mac App Store search query that will let you search for an app's name directly in Alfred and have the search results page open automatically in the Mac App Store. 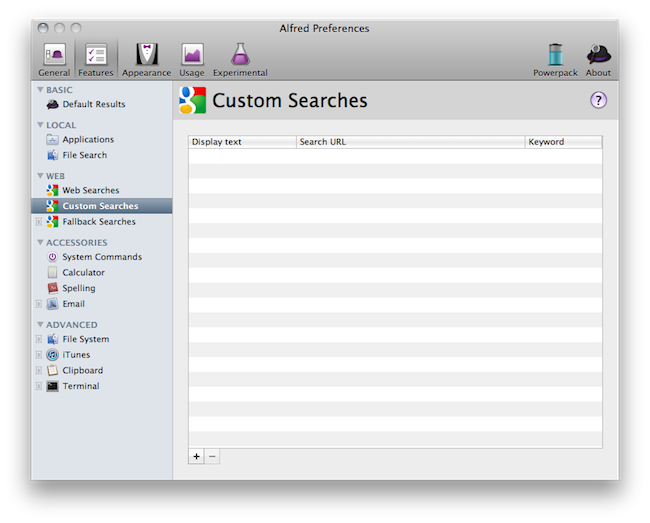 Open Alfred's preferences, select the Features tab and then Custom Searches in the sidebar. Hit the + button in the lower left corner, paste the query in the Search URL field, assign a name (I chose "Search Mac App Store") and a shortcut to invoke the custom search within Alfred, like "mas". Click "Add" and make sure the Mac App Store is running so you can test the command right away. Open Alfred, type "mas pixelmator" (or any other app name) and watch the Mac App Store come in the foreground with an active search page for Pixelmator. A search has been completed in seconds, from your usual launcher, with the keyboard. This method should work with any other launcher that allows you to create custom searches from URLs. As always though, I recommend you give Alfred a try. Perhaps Apple someday will integrate App Store search into Spotlight but right now -- this is the simplest solution I've found to integrate Mac App Store search with OS X.